Synfig Studio Reviews Recently Reviewed! Pros: It is a great solution for 2D animations. You can do a plethora of things, you can create a whole animation movie maybe just using this software. And it's FREE. Cons: The learning curve is big, as it always happens with animation softwares. It would be great if more video tutorials were available. 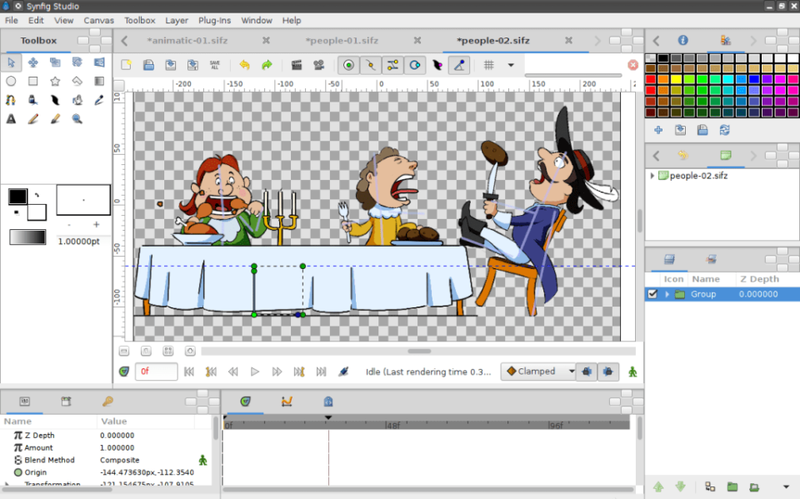 Pros: It is a very simple and free software that allows the user to make vector images and animations. It has a few very simple funtionalities, but overall it can produce some nice results once the user learns how to apply them. I has free hand tools, as well as shapes, and everything can be modified regarding size, scale and form, so it is pretty versatile. Cons: It is pretty difficult to learn how to use it efficiently, and it had quite a few glitches while I was using it (it shut itself down twice in 10 minutes because of errors, something that hasn't happened to me with other programs that work with vector images). It has nice features for a free animation software, but the quality of the end product is going to be very limited anyway. Overall: It is a nice software for small drawings or short animations, so overall I would recommend it for people who are insterested in more minimalistic animations.